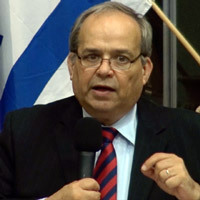 Yosef Livne – The Other Side Of The Story"
Ambassador Livne gave some of the background behind the Gaza conflict, and refuted some of the statements that are parodied in the media about the ability of Palestinians to come and go from Gaza, and to import needed goods. Ambassador Livne puts the responsibility for civilian casualties squarely on Hamas for using civilians as human shields and firing their rockets from schools, mosques and populated neighbourhoods. Destroying some 30 tunnels has been a vital part in ensuring Israel's continuing security. This DVD includes the Q&A from the audience.